One of the ways we evangelicals worship the Most High God is by evangelism, and part of our evangelism is sometimes engaging false ideas about God and the gospel, and part of engaging false ideas about God and the gospel (especially for those in Utah) is contrasting Mormonism with Biblical Christianity — urgently yet patiently presenting this to our Mormon neighbors, and calling people to repentance. So, Mormon neighbors, if you want to let us worship our Most High God (the one who never sinned, who doesn’t have a grandpa), then allow us to evangelize you. Give us a fair hearing, as we should give you a fair hearing. I have valued our friendship for many years and I have done my best to help you. The many hours I spent with you in counsel have been given with pure intent and love. I do not have the time or inclination to discuss or banter with you concerning anti-Mormon “doctrine” that you seem to be obsessed with. You cannot tell me anything that can erase the witnesses of the truth that I have received. They are sacred and well beyond the level of a “warm and fuzzy”. Therefore, I will ask again that you cease to contact me with anti-messages that I do not wish to see or discuss with you. Please respect my wishes. PS – Non-members who do not have the gift of the holy ghost have access to the light of Christ…the Holy Ghost, so that they too can receive a witness of the truth….yes, even a warm and fuzzy. I noticed behind Aaron their is a dead end sign, and the mormons are facing that direction. Its funny way of looking at the picture, but it’s true, Mormonism is a dead end that results in eternal death. Christians have turned from that dead end to eternal life and we now share that. Sadly to many mormons are so blind they don’t see the dead end. That dead end sign is right in front of the Manti temple as if it’s suggesting the temple is a dead end. Mormon temples are a dead end. Dead works are a dead end. Mormonism is a dead end. As for the actual topic, I have found that even the Missionaries that knock on my door don’t want to hear anything about Christianity. They are here solely to sell me Mormonism and that’s it. I haven’t had any luck asking them questions about their god. What is sad is they didn’t know the doctrine of their god, they had never heard that their god was once a man. It’s very hard to have a conversation with a Mormon when they don’t even know basic Mormonism. I have noticed that I get farther with my family when I just quote Jesus. He contradicts Joseph and its right there in black and white. Sometimes I have to tell them to read the whole chapter for context. Joseph was really good at cherry picking. Are you sure Aaron is not the dead end? think you should have made the transition from following Joseph over to Jesus alone by now . We’ll keep praying for you to make that decision soon . Why are you persecuting us? Don’t you believe in freedom of religion? I don’t want any of your anti-Christian lies. We don’t go out and knock on your doors and try to spoil your evening. I’m sure I’m forgetting other equivalents. Clyde, no one ever said, follow Aaron. We said, follow Jesus, not Joseph. Were you doing you best impression of a troll or what’s been labeled here as a “drive by shooter” or “bomb thrower”. I would suggest that since you don’t have anything of value to offer, you are a very poor representative of the LDS church. Your latest “contribution” demonstrates that you have no wisdom, no knowledge and absolutely no understanding of Mormonism, Christianity and certainly not the topic at hand. I would second what Mike R. wrote. then allow us to evangelize you. Give us a fair hearing, as we should give you a fair hearing. I have read many former LDS posters here and Christians in general claim, LDS wont listen to them, or they dont like us sharing with them. Well I agree with the people who say, LDS dont really know what their church teaches or they do and dont care. Here are some quotes from LDS prophets, Apostles and Scripture. pg 188 of Doct of Salvation vol 1. Orsan Pratt still pg 15. We ask from you the same generosity–protect us in the exercise of our religious rights–CONVINCE US of our errors of doctrine, if we have any, by reason, by logical arguments, or by the word of god, and we will be ever grateful for the information, and you will ever have the pleasing reflection that you have been instruments in the hands of God redeeming your fellow beings from the darkness which you may see enveloping their minds. So according to all of this, we should be able to sit down and talk, yet LDS dont or wont, why? What are you so afraid of? And Clyde, you dont help, you just come here, ramble and say things that make no sence or clear things up and then run away. I am a dead end too. My works don’t make me right with God. And I’m a lousy Christian who needs a lot of grace. But I have an awesome gospel to share. Jesus. Grace. Drink from the same well I do and wait with me for the return of the Savior. grindael, geesh, I would appreciate it if you didn’t publicize my cell phone number for now on. Care to share some of your witnessing experiences there in Manti Utah ? LOL, grindael. 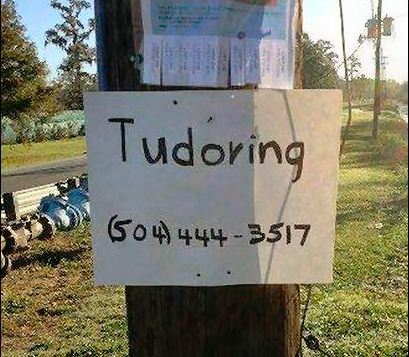 I understand Tudoring can make you lose your head. The topic of worship is terribly important. I think most of us fail at it, in the end, worshiping only on Sunday mornings or maybe in the car jamming to worship songs, failing to truly worship all the other times of our lives. I am sure there is a better definition of worship, but I think worship comes down to celebrating God and relishing His presence. All too often we let other things get in the way and we simply fail to do either. Part of that celebration is to share Him with others. How can we not enjoy God and keep it to ourselves? True joy deserves to be shared, otherwise it is not joy but a personal prize to be kept secret. We can’t hide true joy. Here is a good way to view joy. I’m 3rd. God first, others second, I’m last. I forgot to link joy with God, but joy comes God. God provides joy through worship as we commune with Him. Yeah, especially when you are married to one…… what a great analogy for Mormonism… 🙂 Sorry, Aaron. I’ll ask next time. 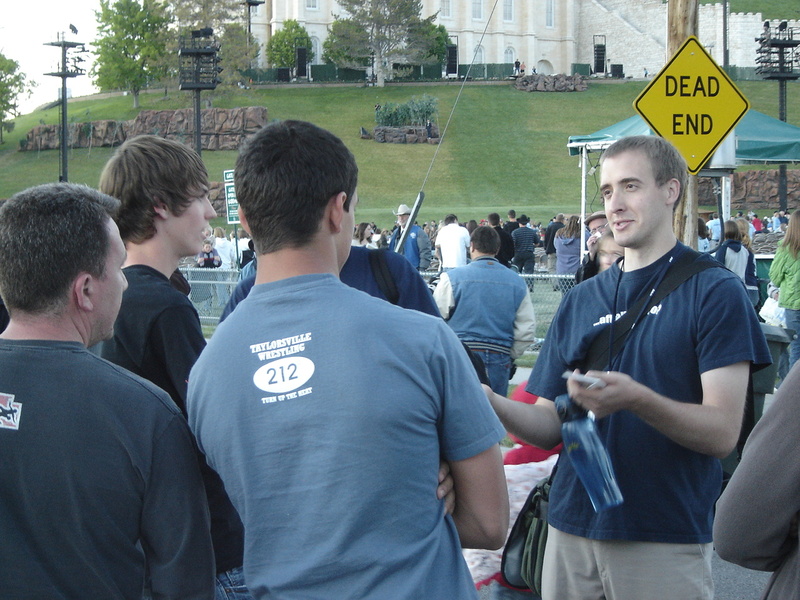 One of the things that Mormons can’t abide with is the amount of time and effort we spend in this evangelism outreach to those of their faith. At the same time they invest an incredible amount of time, effort and money in an attempt to recruit new members from the ranks of Christians, nominal and other wise. What we are doing basically is challenging the claims of Mormonism, getting the news out about the so called “restored gospel” and attempting to win souls for Christ in this particular market niche identified as Mormons. We could simply preach Christ and Him crucified but Mormons think that they are already Christians and have this unique one true church. So it is a necessary part of the process to draw sharp lines of distinction between Mormonism with all it’s different flavors and Biblical Christianity. We also need to give an honest appraisal of Mormon history, its false prophets and false doctrine. Now Mormons call this “anti” but at the same time they would feel perfectly justified in knocking the Christian brand. The Book of Acts demonstrates how we are called to preach the Gospel of Jesus Christ to every nation and to defend the faith to those distorting and misrepresenting this Gospel. The main claim of Mormonism is that the gospel was “lost” and needed to be “restored”. I like to challenge Mormons by asking to prove that Mormonism as it’s practiced today by the Salt Lake City version of the religion, existed in the first century of the church. Mormons go strangely quiet and then try to throw some off-speed pitch about the Council of Nicaea or their favorite conspiracy theory about the Biblical text having been corrupted. They seem to miss the point that even if either of these arguments had any merit, it still doesn’t prove that the primitive Christian church patterned nicely after today’s SLC Mormonism. Can Mormons tell us what the original “restored” gospel “revealed” to Joseph Smith was? Smith changed his mind on who he thought God is at least four times. He finally settled, much to the embarrassment of any Mormon discovering it, on his BoA god which was really the Egyptian fertility god Min pictured in the BoA sitting on his throne exposing himself. My guess is that Smith, working on mysteries without any clues, had no idea what he was putting in this tome and once again got caught with his pants down. earlier . Those are the claims of Mormonism . by representatives of a false prophet led organization . truth . The truth of the gospel of salvation , the truth of who Jesus is , the truth of Jesus’ church . everyone concerned with identifying latter days false prophets/apostles . Evangelism with Mormons is an interesting thing. I don’t think I’ve ever heard of a Mormon throwing in the towel, rejecting Mormonism and becoming a Christian on the basis of a single presentation (of the gospel). It really is a process and from what I gather, it usually involves the Mormon doing study on their own after they become suspicious of the LDS church or Mormonism in general. However it’s still necessary to go out and speak with Mormons where they gather and plant the seeds in obedience to Jesus’ command. It is a form of worship. I only read the first post of this so im not sure where the conversation went. I am a member of the LDS church so I guess that means I have the Holy Spirit right? When I finally decided to step out and investigate my beliefs about the Almighty I found that most of what I believed my entire life was a lie. so if i have the holy spirit that means i should be able to seperate truth from a lie. So why did i come to that conclusion? Actually for me when i saw the lies of lds church it made me question everything else as well, especially the NT scriptures. Sometimes leaving the lds faith is only the tip of the iceberg. I think the post script was also from the letter from his lds friend. The Holy Spirit seals and resides in believers who have been saved in whole by Christ’s finished work on the cross. It is not a right of the LDS church to bestow on people. Nor does it belong to someone who fervently believes in a false god. Belief is only as good as what it believes in.